...and again, and again. This stock is starting to lose its luster as a long-term investment. 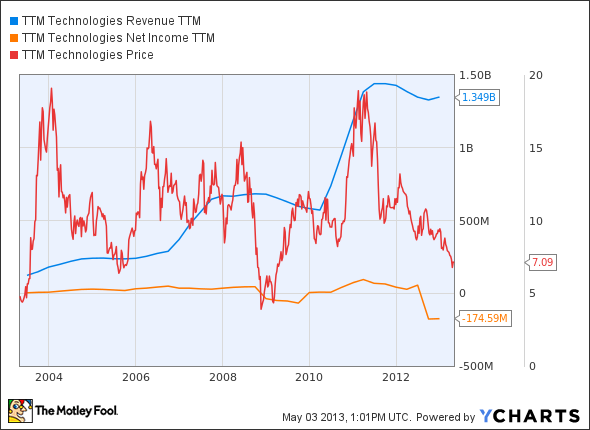 TTM Technologies (NASDAQ:TTMI) makes the circuit boards in your favorite electronics. The company dips into every market from smartphones and tablets, to enterprise-class networking gear, to military hardware. You need a high-quality board done fast? TTM is there. On an anecdotal level, you'd think a company like this should be swimming in money. I mean, take a look around you and count the electronic gadgets. This stuff is everywhere. But somehow, TTM never got that memo. The company has resorted to growth by acquisition in recent years. Profit margins are both slim and unstable. The stock is a neurotic mess, and in most cases dead money even for very patient shareholders. TTMI Revenue TTM data by YCharts. The company reported first-quarter results last night. Sales increased 8% year-over-year to $325 million, led by strong revenue in the cell phone and networking markets but held back by soft sales to builders of computer systems. Non-GAAP earnings fell 43% to $0.13 per share. Adjusted net margins dwindled to 3.3%, down from 6.2% a year ago. Wall Street analysts were looking for earnings around $0.09 per share on $320 million in sales, so these results crushed the Street's estimates by a fair margin. But enthusiasm over the beat is tempered by a modest outlook for the coming quarter, where only the very top of management's guidance ranges match the average analyst estimates. On the earnings call, TTM's leaders discussed signs of recovery in the networking market. Large customers there have started placing orders with longer lead times again, and that's a trend break from several years of shortening order leads. CEO Kent Alder said that "there is overall a tone of more optimism" and "customers are getting a little more confident about the future." TTM's largest networking customers include Juniper Networks and Cisco Systems, which gives the board maker some unique perspective on the networking market. Both Cisco and Juniper could use a boost these days, as network upgrades have been slow on a global level over the last five years. Alder pointed to 4G LTE network installations as a potential driver of fresh growth in the second half of 2013 and onward. So TTM remains as cyclical as ever. Share prices jumped 17% in early Friday trading as investors focused on long-term optimism and a proven earnings beat rather than the gloomy next-quarter guidance. Even so, share prices remain firmly in the middle of TTM's 52-week range. I'm starting to think that this stock is better suited for momentum investors and cyclical traders, and best left alone by long-term buy-and-hold owners. My own long-term bullish CAPScall on the stock is up for review the next time I catch TTM exploring 52-week highs.